Daniel Gundlach designed this piece by incorporating the images of bombers and cluster bombs into a patten from an antique batik sarung. A recent addition to my textile collection is this modern batik sarung designed by my friend Daniel Gundlach. 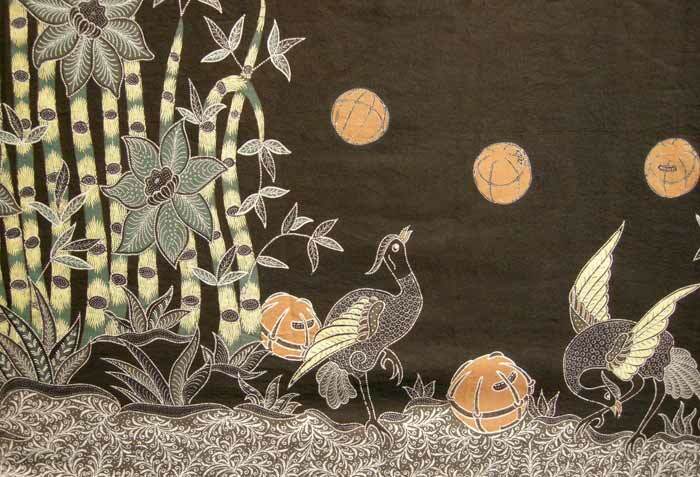 At first glance it's a traditional pattern with marsh reeds and birds, in an unusual color of battleship gray with green and bits of orange. And then you notice... the bombers... and the cluster bombs. Unexploded devices still litter the landscapes of Cambodia, Laos, Vietnam. They have a high rate of failure to detonate on impact, and subsequently lie like tiny landmines, continuing to mame and kill children and other civilians dozens of years after the bombs were dropped. Daniel got a nice mention in the San Francisco Chronicle this week. You can see more of his work and benefit from his excellent eye for batik and other Asian textiles at the Language of Cloth Trunk Show and Sale weekends now through December 24. This reminds me of the Afghan war rugs. They're starting to incorporate images from American propaganda leaflets in war rugs now. What imaginative work! Fantastic that a political statement is made in such an artistic way. Stunning work. Having lived in Java I can tell you that his work is sangat halus! (very refined!) My MIL has a trunk full of authentic Javanese batik from the 60s but I actually like this fellow's more modern use of colors. And, what heart-wrenching imagery. Wow.